It was a bit difficult to pick a single best episode of January. March Comes In Like A Lion had a month of episodes that were spectacular and there were a number of first episodes that so completely sold me on the show that they deserve a mention here; however, no one episode did more then the first episode of After the Rain. I was 75% sure I was going to hate After the Rain and the other 25% was certain that the show would somehow be so generic that I wouldn’t need to watch it. And with that math I was confident about skipping this show until that little voice started niggling me – it’s a noitaminA show … it’s a Wit Studio series … Hiroaki Hirata (Mutta from Space Brothers) is voicing the male character – and I relented. I decided to give the show a single episode to wow me and it did. I’m not saying that I’m suddenly okay with the general idea of a 45 year old divorced guy and parent being in a romantic relationship with a high school girl. No, what After the Rain did was convince me that it had an actual story to tell and wasn’t just some sort of middle-aged male fantasy vehicle. Both characters are introduced and shown to be drifting through life having lost their hopes and dreams for their lives and I think this show will really be about how Akira and Masami can make peace with their circumstances and find new hopes and dreams to make life worth living. I don’t think they will ultimately stay together, but, even if that’s how this show eventually goes that way, they at least have an adokable sort of chemistry between them. 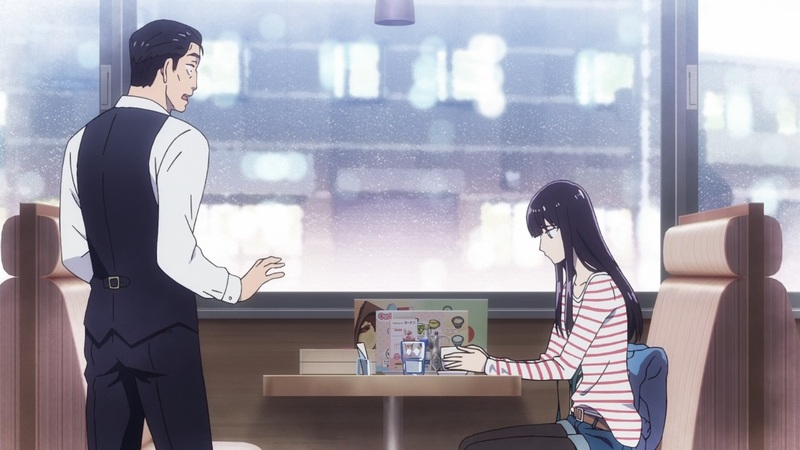 March Comes In Like A Lion lived up to it’s title this month by concluding one story arc in a triumphal roar and immediately switching gears to provide a satisfying shogi-centered story arc that highlighted how much Rei has grown over these nearly 2 seasons of anime. I was initially leery when the show started the arc about Hinata being bullied because I worried it would slide into the “very special episode” format where everything would be magically fixed in only a few episodes. It slowly dawned on me, as the episodes aired, that March Comes In Like A Lion was not interested in the magical easy fixes. I still couldn’t quite believe the show would allow the huge blow-up that would be needed to resolve this arc, but, I was proven wrong this month. We had Hinata heroically stick to her guns and refuse to let the bullies have their way with her. We had an epic teacher meltdown and then Clint Eastwood moonlighting as a teacher showed up to stare down the bully’s terrible mother and the mother was no match for Clint Eastwood. Nor did the show pretend in it’s final resolution of the arc that there won’t be lingering scars in many of the characters involved. 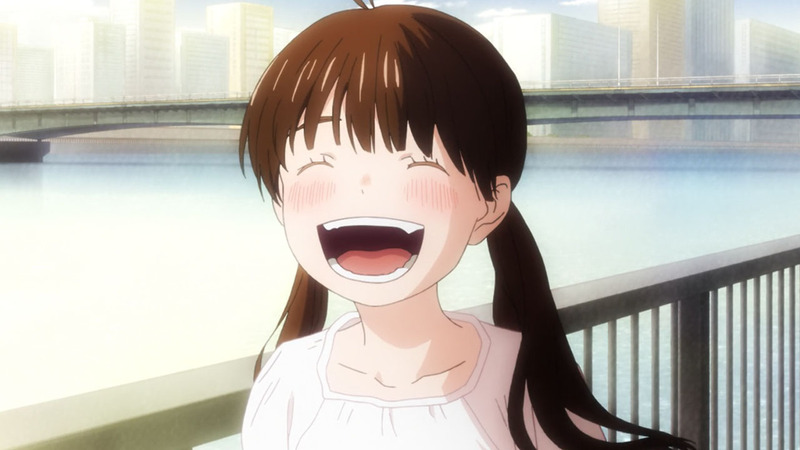 This series seems destined to becoming one of Shaft’s signature series and it’s becoming hard to imagine any other animation studio handling 3-gatsu no Lion as well as Shaft has done so. I was contractually obligated to try this series out. The three most recent works of it’s director – Shinichi Omata / Mamoru Hatakeyama – are: Rozen Maiden (2013), Sankarea, and Shouwa Genroku Rakugo Shinjuu. Aka an unexpectedly great series, a solidly good comedy/horror series, and an instant classic. 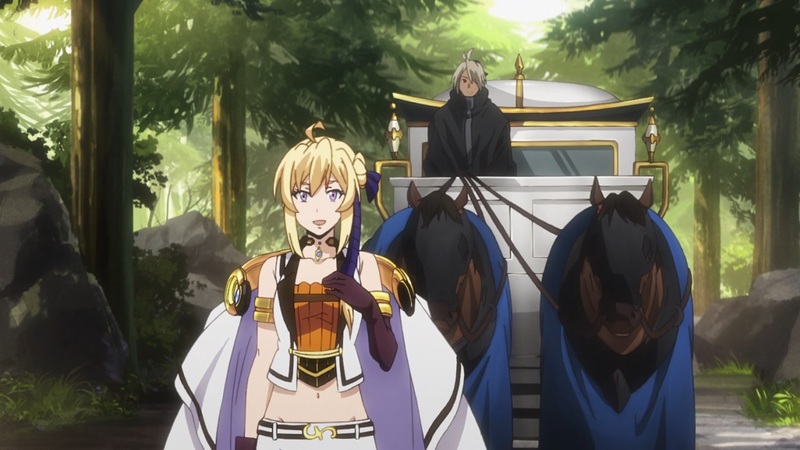 I was hoping this type of pedigree would ensure that Grancrest Senki wasn’t going to be another generic European-style fantasy action anime with poor dress sense and flat, boring characters. Three episodes in and it appears that hope will be dashed. I don’t see any sign that there’s anything noteworthy or good about this anime; it’s as bad as I feared it would be. Truth be told, there hasn’t been a single series by Studio Trigger that I could wholeheartedly like. For example, the story to Little Witch Academia was a royal mess and Kill la Kill always felt like it was missing something. It’s become obvious to even me that Trigger was not the reincarnation of Gainax that I once hoped it would be, though, I didn’t have the knowledge to explain why. It took reading the Sakura Blog’s coverage of Darling in the Franxx to understand. Basically, different groups broke off from Gainax and each group had a differing set of strengths and interests and it was the blending of these groups that made Gainax, Gainax. If I’m reading it right, Darling in the Franxx reunites a number of people who once worked together at Gainax and the result is a series that so far feels like a Gainax series. That’s not a guarantee of quality; not everything Gainax did turned out well. However, there is a positive creative energy surrounding Darling in the Franxx that I haven’t felt from these people since Gurren Lagann. Of course, I don’t expect this series to approach the level of Gurren Lagann, but, Darling in the Franxx feels like it could turn out to be a memorable and outstanding series. Japan is a strange country. After watching thousands of hours of anime I thought I was enured to this strangeness, then I saw this in a recent episode of March Comes In Like A Lion. Look at those apples. Why would you put a huge honkin’ sticker on an apple? I don’t care how gumless the adhesive is, there will be residue. Do the Japanese always peel their apples before eating and it then doesn’t matter to them? Or do they not care? 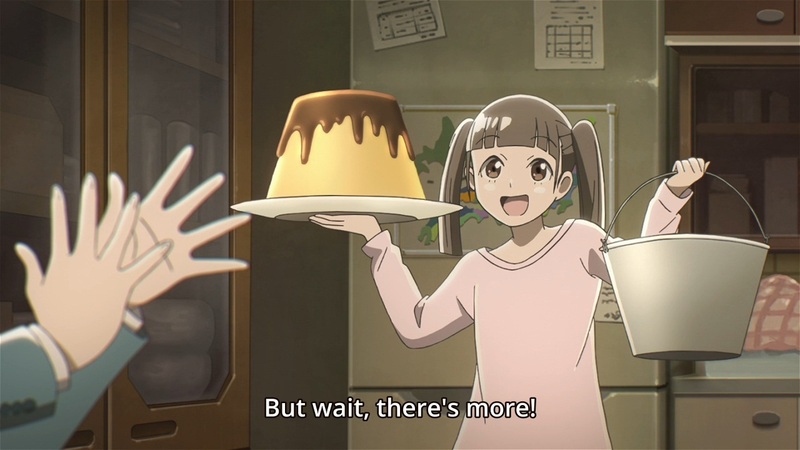 Two of the series that helped change the season from ho-hum to pretty good are Sora yori mo Tooi Basho and Yuru Camp△. Both series could be described as cute girls doing <blank> with going to Antarctica filling in the blank for the first series and camping for the second, although, that sales each series short. Their similarity makes them good candidates for this initial head to head of the winter season and will give me a better chance to talk about both. Characters – winner: Sora yori mo Tooi Basho. Yuru Camp△ has not yet merged their characters into a single camp-going group and the split focus has slowed it’s characters from reaching their fullest potential. They’re a good group of characters and I think when they finally get together the show will see a boost in awesomeness. That said, I would totally camp like Rin – off season because there are no bugs, no sweat, and no people. Sora yori mo Tooi Basho introduced it’s characters quickly and this increased time for the cast’s personalities to bounce off each other has yielded characters that are better introduced and feel more like real people and not mere character types. I particularly like the many sides to Shirase that we’ve seen, having Kana Hanazawa voice Shirase certainly helps but she’s written well as well. Story – winner: Sora yori mo Tooi Basho. 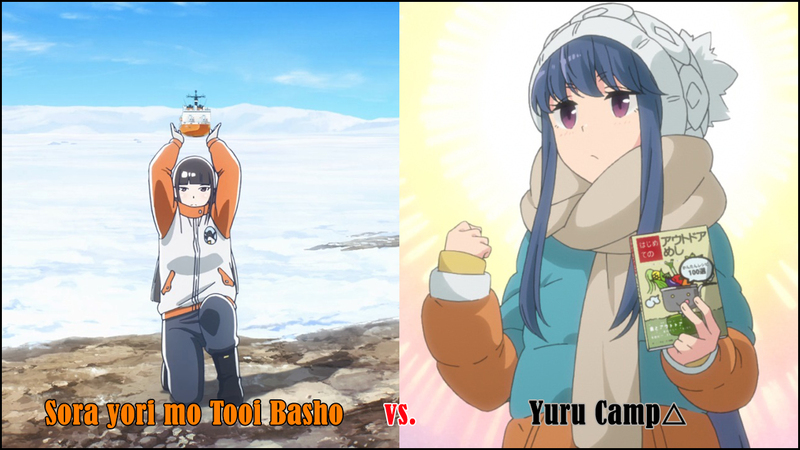 This is a bit unfair for Yuru Camp△ because it is a slice-of-life series focused on the cast going camping; whereas, Sora yori mo Tooi Basho has more of a structured story about the cast going to Antarctica. And as an anime original, Sora yori mo Tooi Basho has the ability to tailor it’s story to fit it’s episode count and that will hopefully mean we can get a completed story from it. Animation – winner: Sora yori mo Tooi Basho. Yuru Camp△ has very solid backgrounds that convincingly convey the attraction of camping out in nature but the actual animation is only decent. It doesn’t hurt the enjoyment of the series – it just can’t compete to Madhouse’s effort with Sora yori mo Tooi Basho. Madhouse could always be counted on providing at least an above average animation effort and this series is no different. Enjoyment – winner: Yuru Camp△. Both series have a great sense of comedic timing and I will find at least one thing laugh-out-loud funny each episode for both shows. Of the two, Sora yori mo Tooi Basho has a greater level of comedy woven into the show; yet, it’s the focus on camping and the beauty of nature that I find so satisfying and enjoyable. Incidentals – winner: Sora yori mo Tooi Basho. Yuru Camp△ is a very solid show and this extends to the OP/ED and seiyuu (two categories I consider here). Sora yori mo Tooi Basho once again does it a little better with the visual gags in the OP and having Kana Hanazawa voicing a main character being two examples of this. So which is the better series? Sora yori mo Tooi Basho. I hope it’s obvious that I like both series and recommend both. If I had to rate them at this moment Yuru Camp△ is about a 10/12 A and Sora yori mo Tooi Basho is about a 10.5/12 Strong A. Both series have some similarities including the whole getting out of the city and experiencing nature vibe, but, they have differing goals and watching one shouldn’t stop people from watching the other. Both series still have room to improve and I think it likely that both series will see their final score creep up another notch or two. Which Airing Series Should I Pick Up? I am trying to limit how many series I pick up this season after the trouble I had last season getting to everything in a timely manner. On the other hand, I really don’t like the idea of missing a series that’s at least worth my time and, based on the surprising strength I’ve seen so far of the season, I have a feeling I might be missing something this season. I’ve picked three shows that I’m not watching that I’ve heard some positive things about. To those reading this, I’m kindly asking for some guidance as to which of these shows are worth picking up. 1) Hakata Tonkotsu Ramens – I’m normally watch whatever Satelight produces and the director has a number of good and great titles under his belt (Full Metal Alchemist, Ikoku Meiro no Croisée, Macross Δ) but the city of assassins idea sounds a bit lame. 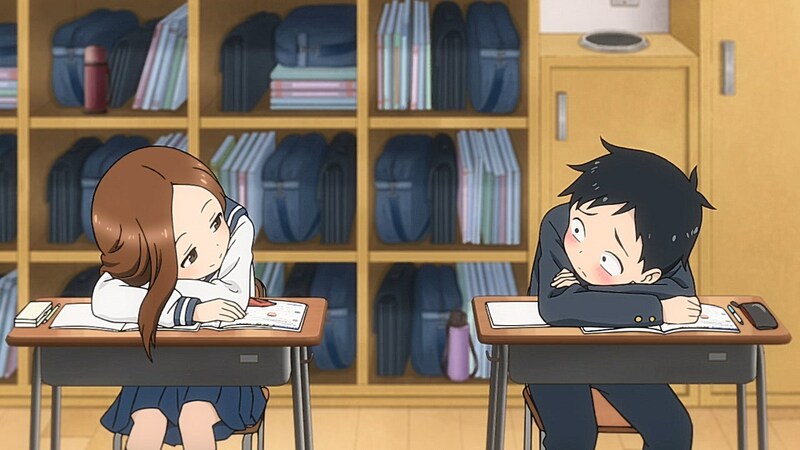 2) Karakai Jouzu no Takagi-san – This kinda sounds vaguely similar to Tonari no Seki-kun and if the lead girl was voiced by Kana Hanazawa like in Tonari no Seki-kun I’d probably have already given this series a chance. Instead, I’m looking at the synopsis and wondering if it’s actually funny and if it’s any good. 3) Death March kara Hajimaru Isekai Kyousoukyoku – Yes, it’s another stuck in a video game series and we know the general track record of those. I’m already watching Overlord 2 this season and don’t particularly want to make space for a second series if there’s nothing particularly noteworthy about it. Nothing in the synopsis or in the publicity pictures points to this series being anything but a by-the-number stuck in a video game series, though, I am willing to give it a chance if I’m wrong about this. I certainly haven’t been disappointed with Violet Evergarden. I’m just not sure if the title will be able to wow me in some area not connected to KyoAni’s production prowess. The director – Taichi Ishidate – has directed one other KyoAni work: Kyoukai no Kanata; which was technically amazing but had a story and characters that didn’t quite live up to the other, better KyoAni shows like Hyouka, Haruhi Suzumiya, Clannad, or Hibike! Euphonium. 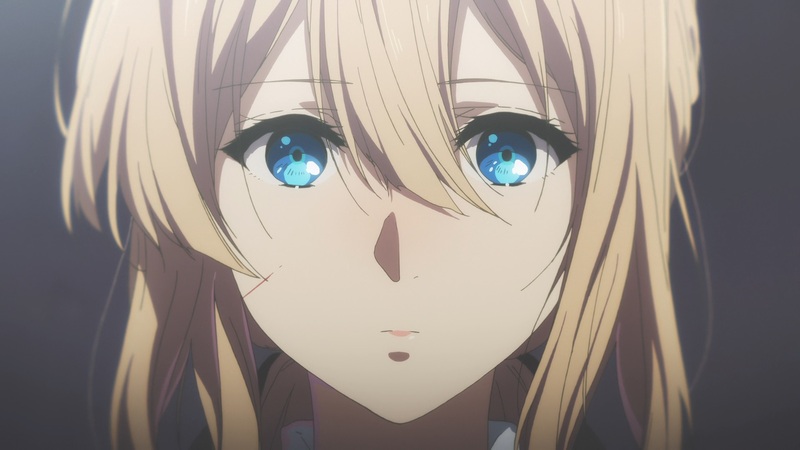 It might be that Violet Evergarden just needs a little time to get it’s story moving and the time spent so far on the side characters might pay hansom dividends later and I will look back and laugh at my worries here. As the saying goes, only time will tell. One area I’m completely invested in is finding out what exactly happened Gilbert. The way it was said makes me wonder if Gilbert isn’t in some sort of coma and not actually dead. Which could mean he eventually wakes up, maybe when Violet finally gets the chance to visit him. 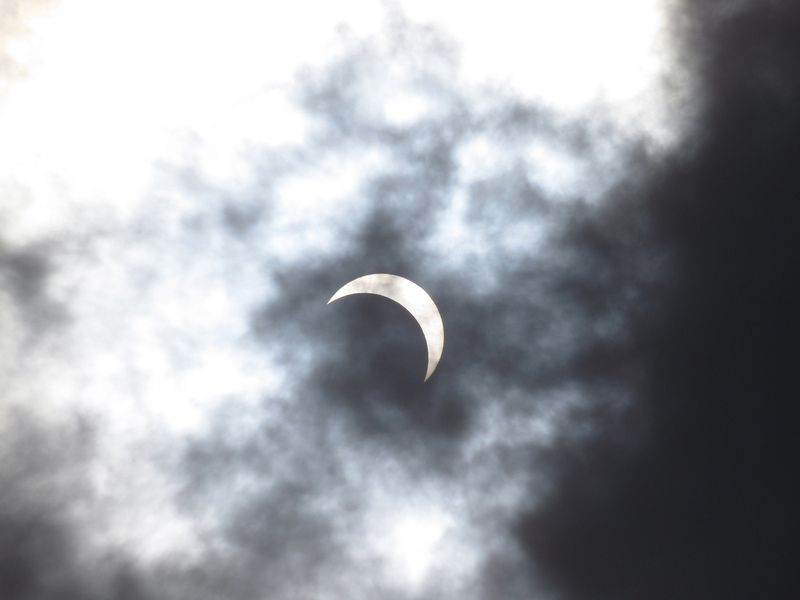 … Okay, I know. I can just sense the eye-rolling out there. I don’t care; what’s wrong with hoping for a happy ending. Well, I’d like to say 3-gatsu no Lion but the stupid Olympics is preempting the series for most of February. Instead, what I’m looking forward to in February is seeing if the new shows, that showed promise in January, will be able to continue to impress as the season moves into it’s middle third. On the non-anime front, my family is celebrating our homemade holiday of Christmas in February. It started as a joke one year when the last bit of Christmas cookies were taken out of the freezer in February (my Mom makes a lot of Christmas cookies each year) and over the last 20+ years it kinda snowballed from there. There’s a tree that gets decorated – it is a small 5 foot artificial tree that was like 15 bucks and found at an after-Christmas sale – and the whole family gets together for a nice dinner, Christmas cookies, and the playing of bingo with a table of small items wrapped as presents that are the prizes for winning. I had to stock up on candy this time because my 6 year old nephew is a bingo playing fool and cleaned up last time and we ran out of items he would like. I will say that while it’s not necessarily uncommon to see stickers on apples here in Japan, they’re typically not /that huge. I can’t see the details of the stickers up close, but maybe the apples are supposed to be on sale or something and not great quality. Fruit here is expensive, often seen as a luxury or gift item, and the really good stuff would never get a giant sticker like that plastered over it. 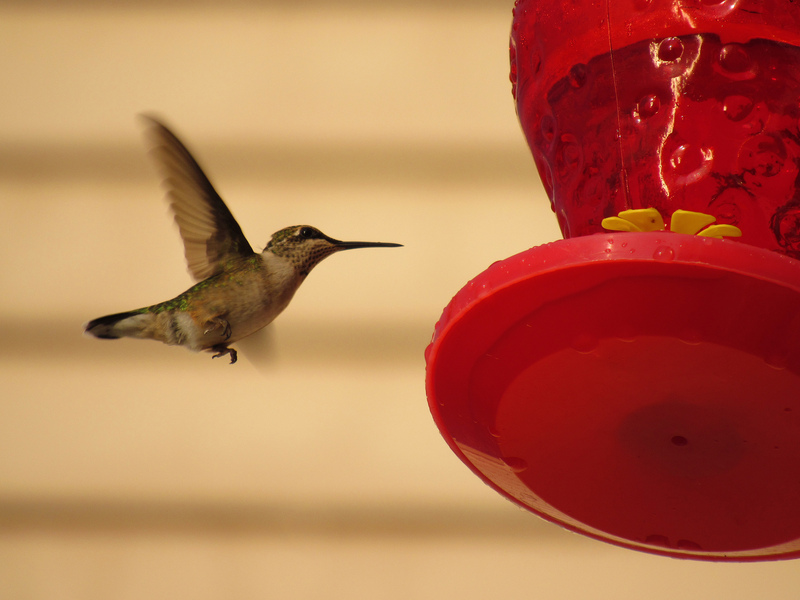 @Artemis: Thanks for the comment. Okay, so maybe it’s just a bit of anime over-exaggeration. 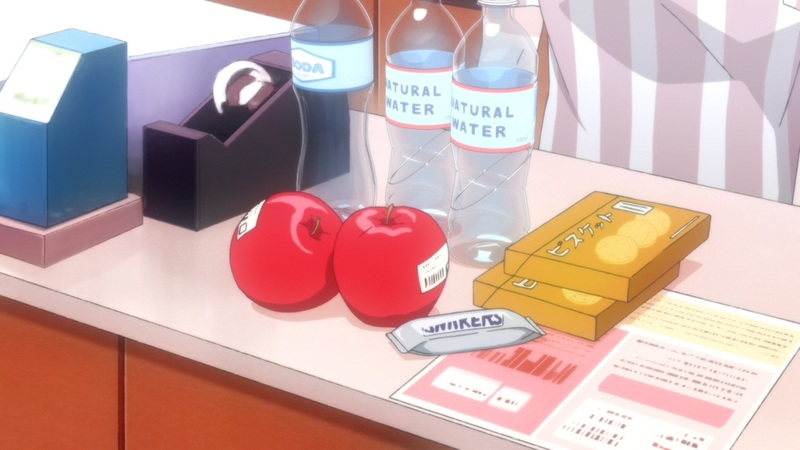 It looks like these stickers have some sort of barcode on them and I was trying to figure out if that meant those apples were priced by the apple and not by the pound like it’s normally done in America. I figured fruit would be expensive in Japan so I thought they would be handled with care. But I didn’t realize they were that expensive. I guess that explains why I often only see people eating apples in anime after someone’s taken great care into cutting them into those cute rabbit slices or when they are given to people in the hospital or when recovering from a sickness. It’s a different mindset from what I’m used to where I can drive 5 miles out to the farms in fall time and pick my own apples off the tree and pay like 10 dollars for 20 pounds of apples.